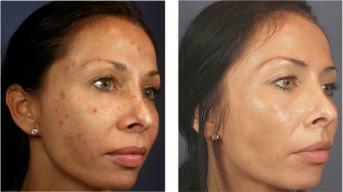 VI Peel treatment at Just Skin, Inc.
Vi PEEL chemical peel – The only seven day skin transformation system in the world! Why choose Vi PEEL over the others? For Anti-Aging – It reverses the effects of sun damage, environmental factors and time to enhance our skin’s natural beauty. In addition to facial treatments, the Vi PEEL can also be used to treat sun damage on the decolletage and hands. For Acne – highly effective in clearing acne and impurities for patients as young as twelve years old; a series of treatments may reduce acne scars. An application of the Vi Peel is virtually painless! A handheld fan may be used to increase comfort. You may feel a tingling sensation as the peel is applied. The procedure is quick and takes only 20 minutes or less. No skin preparation products are needed and minimal or no downtime is required. Healing time is minimal – enjoy younger looking, more beautiful skin in about one week!